Hello, my fellow knitters. I am starting an ongoing project. I will be recording a daily sky in my approximately 72" long scarf. Every day, I will be posting my progress on THIS particular page. 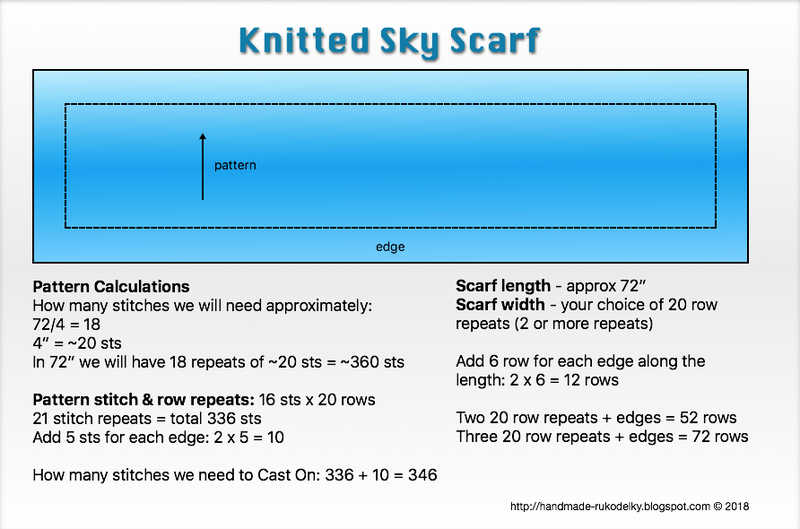 If you would like to join me in this knit-along project then save this page and return to it for day-by-day short narratives updates, including images, charts, links to other pages, and videos of this pattern. This scarf is for knitters that love cables. 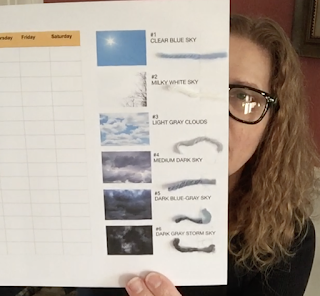 Observe a sky every day to create a unique scarf for anyone. It is to be cast on many stitches and knitted lengthwise, where rows create the width of the scarf. I used worsted yarn, but you can use thinner yarn, provided you will adjust both, a number of stitches and rows that are important for pattern repeats. 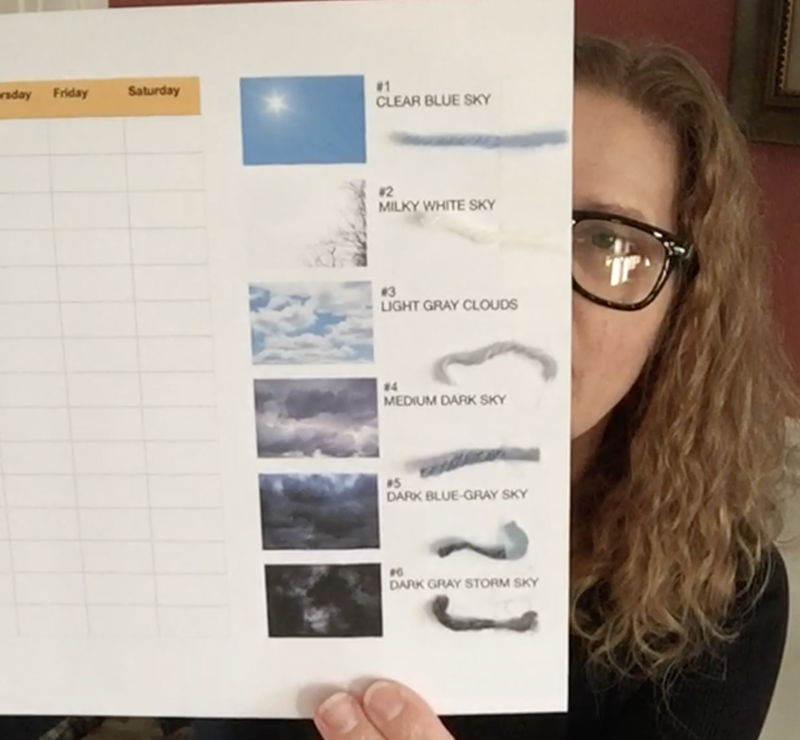 Each row is started with a new string (depending on the color of the sky), leaving long tails for a fringe on both sides. 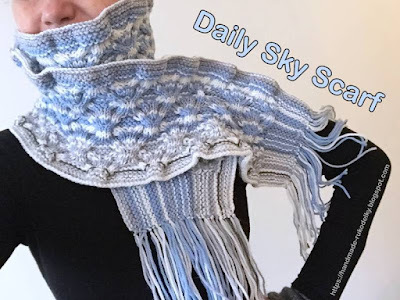 If you know how to knit basic knitting stitches and a cable you can knit this scarf. 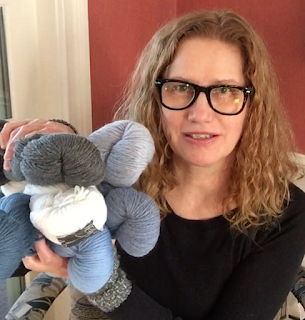 I provide several "how to" videos to help knitters that would love to try a cable project. 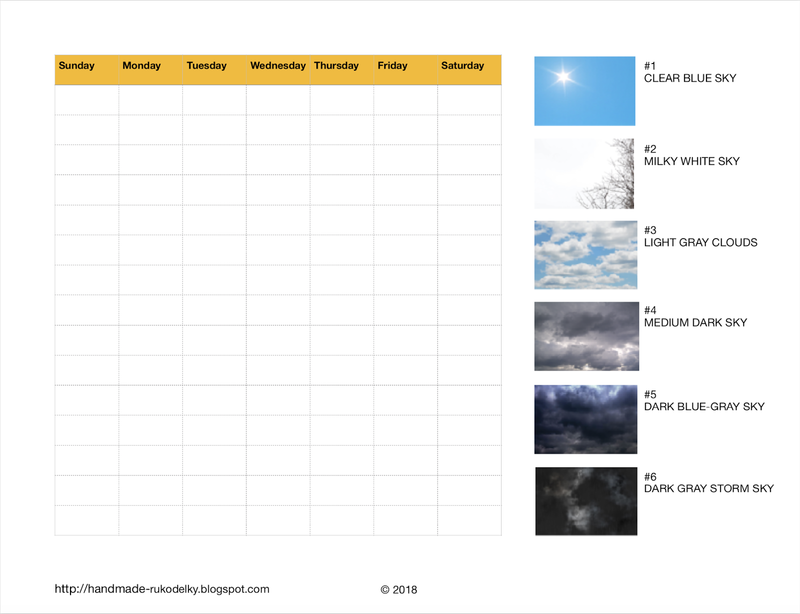 If you would like to print any of the charts, you can click on the image to make it bigger and then print it. 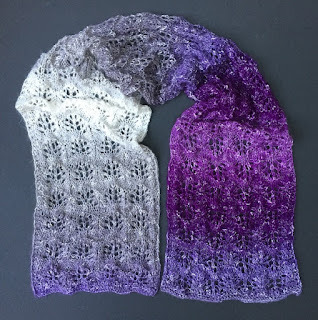 About the materials - you can substitute with your own choice of yarn - a scarf doesn't need to be exact, it can be a little narrower/wider or shorter/longer. Your knitting needles should correspond with a manufacturer's recommendation that is printed on the label. So let's do it. 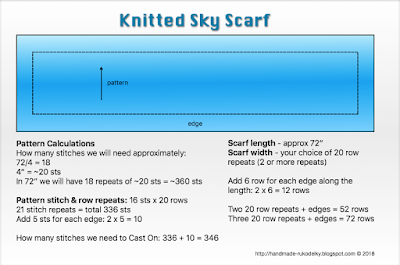 In the image below I am showing how I calculated my stitches for the scarf. I will make either two to three (and possibly even four) 20-row repeats - I am not sure just yet. Width: finished width is ~7"
Now we are getting into cables. You will have to pay big attention to right-leaning and left-leaning cables, PLUS if you will be knitting all four sts of your cable, or purling2/knitting2 OR knitting2/purling2. It is very important to concentrate on your knitting (no distractions!!) so you get that beautiful 3D pattern. You do not want to frog anything, right? Link to the finished VIDEO #2 (for righties) is mentioned above. But I must warn you - I made a big "booboo" which I am explaining somewhere toward the end of the video (on day 10) - so pay attention to what happened. It is not affecting the pattern if you did it right - unlike me 🙄. Luckily I didn't have to re-record the rows again - but the number of stitches in my scarf's edge are different now, so I altered "K5" to "K-edge" in the written pattern. As you see it is turning into an adventure 😀. By the time I am finished with this scarf, we should have this pattern written without mistakes. Hopefully 😁. Link to the finished VIDEO #3 (for righties) is mentioned above. Link to the finished VIDEO #4 (for righties) is mentioned above. Link to the finished VIDEO #5 (for righties) is mentioned above. REPEAT ROWS 7-26 TWO TO THREE MORE TIMES (DEPENDING ON HOW WIDE YOU WANT YOUR SCARF. 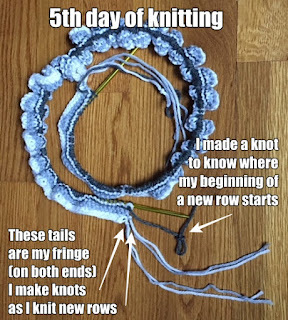 TIGHTEN UP ALL THE TAILS (IF YOU DIDN'T DO IT ALREADY) AND MAKE KNOTS USING 2 YARN TAILS (1 TAIL FROM EACH OF THE ADJACENT ROWS) AS CLOSE TO YOUR KNIT AS POSSIBLE. WHEN FINISHED TIE-ING ALL THE KNOTS MAKE ANOTHER ROW OF KNOTS BY SEPARATING EACH PAIR AND PAIR STRINGS AGAIN WITH EACH YARN TAIL FROM THE OTHER PAIR - MAKE KNOTS IN A STRAIGHT LINE. EVEN OUT YOUR FRINGE BY CUTTING IT STRAIGHT ACROSS IN THE DESIRED LENGTH.